This was an IP phone that was at one of the vendor booths. 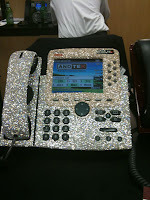 The next time someone asks me for a flashy phone, I'll send him here. Obviously, this was not a real product but just something to get people to stop at their booth. My Mini9 lasted all day without being plugged in and it worked fine on their IPv6 wireless network. I'm one of the few who actually connected to their IPv6 site and registered but everyone using the wireless was going to Google using IPv6 as their transport whether they knew it or not. I'll be interested in the statistics if they ever release them. Instead of the turtle with the moving fins, they had a dragon waving its arms. Considering that there are 10,000 people at this conference and only 5 submitted their names on the IPv6 form is somewhat frightening. After all, these are all router jockeys, network engineering types. I guess that shows the state of IPv6.